Now you know how to behave if your Russian friends suggest a small (or not so small) drink. Modern Russians don’t drink booze like many movies depict - in fact, more and more people are abstaining from alcohol altogether in the country. However, some old school Russians still follow these drinking traditions, more for fun than anything else. So, your Russian friends invite you to a party and start feasting on tasty dishes and alcohol. If you’re late, they can make you drink a “penalty” shot glass. What is it? The “penalty” shot was introduced by Peter the Great, who tried to train his subordinates not to be late. He forced tardy employees to down a 1.5 liter glass of vodka in one go - we don’t know if this stopped people turning up late but the tradition has survived, although luckily these days you’re Russian friends will only make you neck one shot. According to another Russian tradition, you should not eat after the first glass of vodka and there’s no break between the first and second glass of booze. The rest period between the second and third glasses is also tiny. What’s more, you’ll hear multiple toasts during every round of drinking. Read more about toasts here. Russians believe that food (especially fatty dishes like mayonnaise salads) reduce alcohol volume. So if you don’t want to get drunk too quickly try to eat more Oliver and kholodets. Remember, Russian bashes usually last for several hours. Even if you don’t know Russian, you’ve probably heard the toast “Vashe zdorovye!” (“For your health!”). How is one’s health linked to alcohol? In the times of Ivan the Terrible, Russians used vodka to make medicinal tinctures. However, the drink has changed a little today but a good old toast always goes down well. 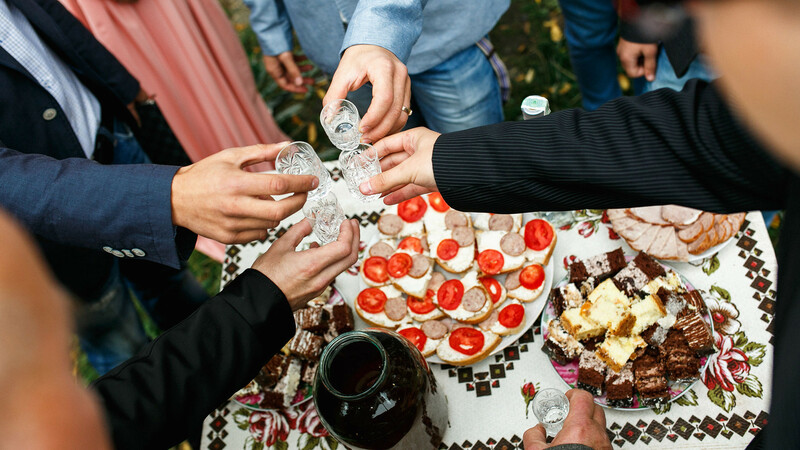 When a guest needs to leave a party, the host usually proposes one last drink “for the road.” In Russian, it sounds like “for a walking stick (“napososhok”).” In the past a guest necked a small glass that was placed on a stick’s handle but if the glass fell (due to poor balance) one would have to stay at the party all night to avoid “a bad road.” This was probably one of the first alcohol tests before breathalyzers were invented. As soon as vodka is poured into glasses you should immediately remove the bottle from the table. It’s said that this tradition comes from the time of the Napoleonic Wars. After the Battle of Paris in 1814, Russian Cossacks noticed that the number of drinks people were charged for was calculated by the number of bottles left on the table in local restaurants. Supposedly this is why Cossacks cleverly placed the bottles under the table. In Russia, you may often hear the phrase: “Soobrazitnatroikh” (“Think for three”). And if your two friends say this, it’s simply an invitation to drink vodka together. The expression probably comes from Nikita Khrushchev’s reign and his struggle for sobriety. Vodka became much more expensive back then: A bottle cost about three rubles and it was prohibited to sell it on tap. So the Soviets began organizing troikas to buy vodka. According to another version, Russians just wanted to drink in good company. As Russians joke, vodka connects people. When a Russian buys a new car or any other expensive item they should “wash the purchase” (“obmytpokupku”). Of course, only figuratively speaking. It means one should celebrate with friends or relatives or the purchase won’t bring happiness. In ancient times people believed that buying something expensive might make neighbors green with envy so they invited a priest to bless the item with holy water. This later transformed into a symbolic "washing" of the car (or whatever) by making a toast to the new item with vodka. The person who starts pouring glasses should keep do it until the bottle is empty. If the pourer is changed before it’s said people will get too drunk or a fight will break out. Actually, anything can happen after enough booze has been downed. The vodka supply may finish before the party ends - so someone may have to rush to the shops to get more. If you’re not from Russia but have similar drinking traditions in your country, write them in the comments section below.